Flex-A-Min Review – Is This Product Safe To Use? 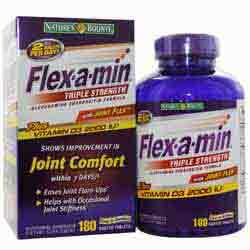 Flex-A-Min is an over-the-counter joint pain relief brand that is available in a number of different formulas. The information on the company website is limited, just covering the basic details for the individual products. A customer FAQ section is provided as is a link to the product television commercial. A section headed ‘Health Research’ is actually just the company’s mission statement and links to Arthritis organizations. No actual clinical research for any of the ingredients is provided. Also, unlike many health product websites, no customer testimonials are shown. While it is not offered for a free sample, the consumer can download printable discount coupons, redeemable in the stores where it is sold (for which the website provides a convenient list). Flex-A-Min comes in four different formulas including Triple Strength and Complete. All products contain roughly the same active ingredients with certain extra vitamins and minerals added to different formulas. Apart from this, only the ingredient amounts differ. As with all the formulas, it contains a blend of Glucosamine, Chondroitin and MSM, all commonly found in traditional joint pain relievers. Working synergistically these ingredients help to repair any damaged joint cartilage and, being the ‘building blocks’ of healthy joints, rebuild and maintain the cartilage, connective tissues and muscle in the body. The addition of Hyaluronic Acid is important for its ability to produce the lubricating synovial fluid that ensures joints move smoothly and without friction. In this particular formula, Boswellia is used in a proprietary blend since it is effective in reducing inflammation. It could be a choice for anyone hoping to prevent aging joints from becoming worse and to help relieve any existing minor stiffness and pain. It is advisable for the consumer to consult with a pharmacist for help in choosing the most suitable formula, although all contain the essential active ingredients. The only aspect of this product that may deter some consumers is the lack of clinical studies performed on the brand, although there is plenty of evidence to show the beneficial qualities of the individual ingredients. I took this supplement as recommended. After 20 days, I didn’t notice any improvement in my movement. The pain is still there. I am unable to walk without pain.